Published: Mon, July 1, 2013 @ 12:00 a.m. There has been a lot of buzz lately about levels of radioactivity in the cuttings, drilling fluids and produced water from shale-gas drilling activities, especially those from the Marcellus and Utica shales. Environmental-activist groups would like us to believe the Marcellus and the Utica are dangerous sources of radio-nuclides that will contaminate our soil and water for eternity, and businesses looking to capitalize on waste handling and disposal would like for us to believe there is nothing to be concerned about. As we all know, the truth lies somewhere in between these two extremes. Compared to other common sedimentary rocks, shales generally contain higher concentrations of radioactive metals (radionuclides) such as uranium, thorium and potassium. Shale is rich in clay, and radioactive potassium (K-40) is a common component of the clay minerals. Uranium (U-238) and thorium (Th-232) are naturally absorbed by clays through a process known as cation exchange. In addition, uranium and thorium have an affinity for organic matter. Consequently, organic-rich shales are recognized for being enriched in radionuclides. My colleague often refers to organic shales as nature’s activated carbon filters, since they accumulate radio- nuclides gradually over time. The decay of these radionuclides produces gamma rays, a property that has been used for ages in wire-line well logging to distinguish shale and nonshale rock. Organic-rich shales can be considered low-grade sources of uranium. The Chattanooga Shale of Tennessee, Kentucky and Alabama, for example, is estimated to contain between 4 million and 5 million tons of uranium. Only one organic-rich shale, the Ronneburg deposit of eastern Germany, has ever been commercially productive, and this shale was hydrothermally enriched in uranium. It is clear that we are not looking at high levels of radionuclide enrichment with the Marcellus and Utica shales. So, what exactly is the concern, and do radionuclides present a significant environmental risk? To address these questions, we need to define a few terms and touch lightly on the radioactive decay of uranium and thorium. Two obscure terms are NORM and TENORM. NORM is an acronym for Naturally Occurring Radioactive Material, and TENORM is an acronym for Technologically Enhanced Naturally Occurring Radioactive Material. All organic-rich or black shales contain NORMs. The U.S. Environmental Protection Agency considers radionuclides brought to the surface by oil and gas drilling and production activities to be TENORMs since the drilling and production processes can concentrate radionuclides. By definition, radionuclides are unstable, and they naturally decay to produce a variety of daughter products. The radioactive decay of thorium 232, which has a half-life of 14 billion years, produces water-soluble radium-228 (Ra-228). The decay of uranium 238, which has a half-life of 4.5 billion years, produces water-soluble radium-226 (Ra-226). Ra-226 and Ra-228 are important because they are water soluble and can move within natural water systems. If they are ingested, they can incorporate into bone tissue. The internal emission of alpha particles and gamma radiation from the decay of Ra-226 and Ra-228 increases the risk of cancer to varying degrees in all tissues and organs. There are three waste streams from shale drilling and production — produced water, drilling fluids (drilling mud) and rock cuttings. Produced water, which is mostly brine, has the greatest likelihood for Ra-226 and Ra-228 concentration since brine would be the natural carrier of these radionuclides. Outside of potential spill and leakage risk, there is little opportunity for human exposure to brine as it is injected deep into the earth using Class II injection wells. The drilling fluids used in the horizontal leg portion of Marcellus and Utica shale wells are synthetic-based and very expensive. Drilling fluids are continuously cycled down the drill string and back to the surface with well cuttings. The cuttings are separated, and the fluid is returned down the drill string. During the course of drilling a well, drilling fluids likely are enriched in TENORMs. Drilling fluids companies such as Baker-Hughes essentially rent their fluids to the drilling companies. Once the drilling of a well is completed, the fluid is returned, cleaned and prepared for use in another well. This process is repeated over and over again. Similar to brine, outside of potential spill and leakage risk, there is little opportunity for human exposure. Drill cuttings (shale chips) are a waste product that must be disposed of. Drill cuttings are separated from drilling fluids at the drill site using large centrifuge systems designed specifically to recover drilling fluids. The final product that is removed from the drill site in roll-off waste containers is dry shale rock chips. The rock chips may be incinerated before disposal in dedicated pits, or they may be disposed of within municipal solid waste (MSW) landfills. 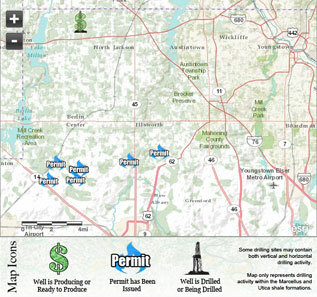 Ohio MSW landfills may receive solid waste from the drilling industry provided the waste does not exceed the Maximum Concentration Limit (MCL) of five picocuries per gram above background for combined Ra-226 and Ra-228. The concern about drill cuttings in MSW landfills is that Ra-226 and Ra-228 can accumulate in leachate, which is monitored and collected at the landfill. Leachate may be sent to wastewater treatment plants, which, in turn, could release the radionuclides into surface waterways. The concern about radionuclides in drilling fluids is exposure of workers to elevated Ra-226 and Ra-228. These are legitimate concerns and ones that need to be addressed as the industry develops. Just exactly how the shale-gas industry in Ohio will develop is anyone’s guess. It is certain that Ohio is the proving ground where shale gas best-management practices will be developed to the benefit of everyone. The current discussion on NORMs and TENORMs is the latest in a series of environmental safety issues that is being resolved right here in Ohio. In the process, the truth about radioactivity and shale-gas development will be known.